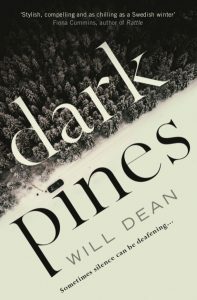 I thoroughly enjoyed Dark Pines. The atmosphere Will Dean has created is deeply unsettling all the way through. It’s full of wonderful descriptions of the living, breathing forest, which is a constant threat to the protagonist, Tuva. She is unique and believable – a journalist chasing a story gives it an angle that was easy to relate to. I thought I’d guessed whodunit, but I was wrong! Each of the quirky and creepy residents of Mossen village are expertly brought to life and in my mind any of them could have been the murderer. Extra tension is created by Tuva’s personal life – her hearing aids running out of batteries and her constant worry about her dying mother. This is a compelling read. Highly recommended. Published: 4 January 2018 by Point Blank, an imprint of Oneworld.